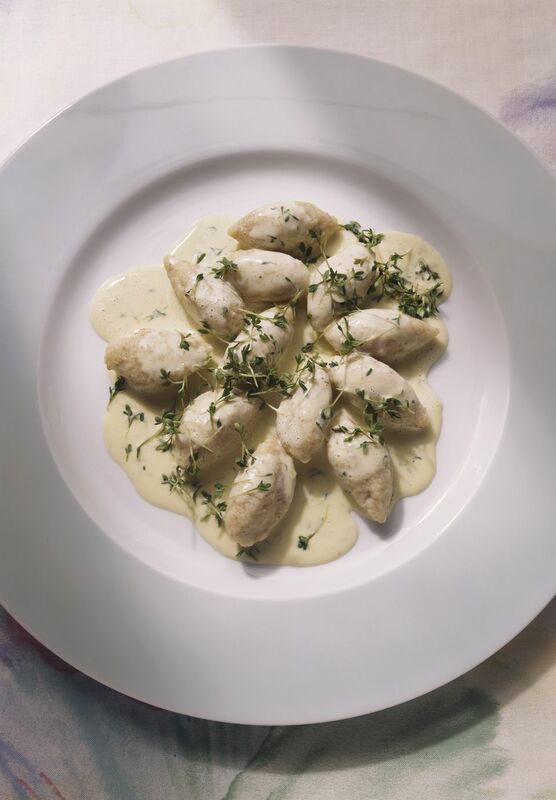 This recipe for Polish potato drop dumplings—kartoflane kluski (kahrr-toh-FLAH-neh KLOOSS-kee)—uses raw, grated potatoes instead of mashed potatoes as this potato dumpling recipe does. These dumplings couldn't be easier because there is no rolling or cutting involved. The slack or loose dough is dropped into the water by spoonfuls and boiled until tender. And there are no eggs in the recipe! They are the perfect accompaniment for pumpkin soup or on their own with butter and caramelized onion. Bring a large saucepan of salted water to a boil. Meanwhile, in a medium bowl, mix together grated potato, flour, milk, salt, and pepper until a thick paste forms. Dip a teaspoon in the boiling water, then dip a teaspoon in the dumpling mixture, picking up half a teaspoon or so, and slide it into the gently boiling water. Continue until all the dumpling dough is gone. Simmer about 20 minutes or until dumplings taste done. Drain in a colander and serve as a side dish, a Lenten/vegetarian meal or in soup. Potatoes, those funky, amorphous-looking tubers are like nuggets of gold in Poland. In fact, they are so popular, there are no less than nine words for potatoes in Polish. The preferred word ziemniak, also known as jabłko ziemi or "earth apple," is used throughout Poland, but especially in Warsaw (Warszawa). Another popular term is kartofel from the German kartoffel. It's used throughout Poland, but especially in Silesia (Śląsk). Some people say perka is the oldest word for potato and is derived from the Polish word for "Peru" (where potatoes originated). In the Poznań region, potatoes are known as pyra. In the eastern Podhale region (the mountainous Góral region), they are called grula, which can be translated as "spuds" or "taters." In Orawa, in western Podhale, they are known as rzepa. In the Kaszubian region in northeast Poland along the Baltic coast, potatoes are called bulwa, while in the Lwów region, they're known as bandura, and in Lemkos, the southeastern Carpathian Mountain region, they're called kompera. It's interesting that the potato, the quintessential Polish vegetable, was first domesticated in South America and brought to Spain by Pizarro around 1570. Then they worked their way to other parts of Europe. It is believed King Jan Sobieski III introduced the potato to Poland in the 17th century from Vienna where he had defeated the Turks. For a long time, potatoes as a foodstuff were considered poisonous or evil, and they really didn't catch on with the aristocracy until the middle class saw their merit. Potatoes grew well in Polish soil and they became so plentiful, they were affordable for the peasants to purchase at the markets and then grow on their own. Soon after, popular root vegetables like parsnips, turnips, and rutabagas were supplemented with potatoes and, eventually, overtook them in popularity.